The Large Hadron Collider beauty (LHCb) collaboration today announced results that confirm the existence of exotic hadrons – a type of matter that cannot be classified within the traditional quark model. Hadrons are subatomic particles that can take part in the strong interaction – the force that binds protons inside the nuclei of atoms. 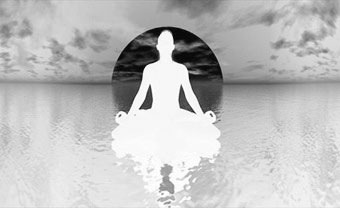 Physicists have theorized since the 1960s, and ample experimental evidence since has confirmed, that hadrons are made up of quarks and antiquarks that determine their properties. A subset of hadrons, called mesons, is formed from quark-antiquark pairs, while the rest – baryons – are made up of three quarks. But since it was first proposed physicists have found several particles that do not fit into this model of hadron structure. Now the LHCb collaboration has published an unambiguous observation of an exotic particle – the Z(4430) – that does not fit the quark model. This is like finding a four-leaf clover, but really geeky. Isro successfully launches navigation satellite IRNSS-1B. Sentinal-1A satellite, successfully launched on Thursday, is expected to provide regular access to key environmental data for European citizens, policymakers and service providers. U.S. lawmakers press defense officials on use of Russian-made rocket engine. With much more than the ISS at stake, Europe stays the course on Russian space partnerships. Confrontation between SES and European Commission over a June launch slot on Arianespace seems to have been avoided by delay in delivery of Europe’s next Galileo GPS spacecraft. 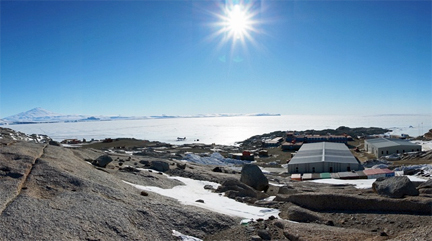 Avanti and Quortus achieve world first in delivery of 4G over satellite. Airbus is selected over Thales Alenia-OHB for billion-dollar ESA weather satellite contract. Intelsat, BT, Ericsson, Newtec and Sony demonstrate next steps to make 4K UHDTV a commercial reality. After two-year hiatus following filing of bankruptcy, LightSquared has resumed cash payments to Inmarsat to reactivate an agreement on reorganization of L-band spectrum. Optus signs $19.5 million deal with Australian Department of Defence to continue providing managed satellite services until 2018. U.S. Air Force hopes to use Operationally Responsive Space (ORS)-5 mission as space surveillance gap filler and pathfinder for future SBSS satellite technologies. $518 million military weather satellite, Defense Meteorological Satellite Program Flight 19, is successfully launched after 15 year wait. U.S. Air Force identifies six candidate payloads, half from civilian agencies, that could be matched with commercial host satellites in its soon-to-be -awarded Hosted Payload Solutions contract. Large Iridium shareholder calls for sale of company, saying management has consistently ignored interests of shareholders and cannot estimate cost of second-generation satellite constellation. Avanti Communications is selected by Turkish telecom operator ESEER Telekom to deliver its satellite broadband coverage in the Middle East Region. Arab States Broadcasting Union picks EUTELSAT 21B as broadcast exchange gateway between North Africa, Middle East and Europe. KVH increases its lead in the maritime VSAT market according to latest report from Euroconsult, reaching a 26% share of the industry’s 11,000 activated maritime VSAT terminals. Comtech Telecommunications receives $3.7 million in orders from an international OEM for High Power Amplifiers to be used for jamming communications. U.S. Air Force requested demonstration by Northrup Grumman shows Global Hawk can used additional satellite link to transfer command and control signals separately from mission data. 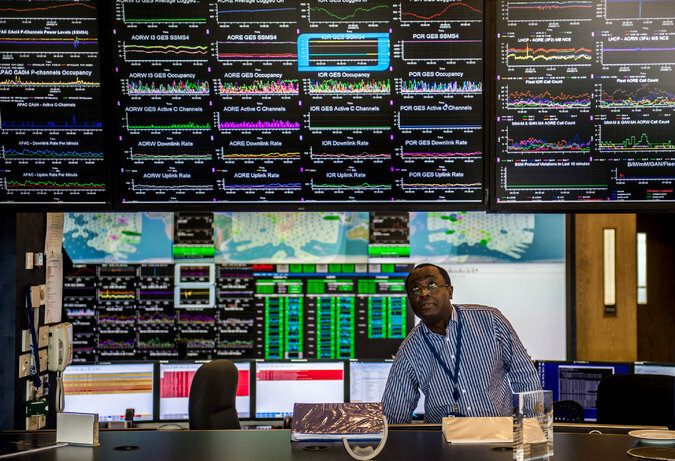 Inmarsat will provide satcom hardware and airtime to the Think Global Flight mission flying to 25 countries and 31 U.S. states to highlight importance of science, technology, engineering and math education. Australian satellite broadband provider NBN adds capacity for 9000 more users. Asianet Satellite Communications expects to grow its broadband subscribers by 50% due to its migration from Docsis 2.0 to Docsis 3.0. Israel-based NovelSat is offering to provide broadcasters with free bandwidth, per se, through its newest product: FreeBand. GT-SAT deploys MaxLinear MxL862 SoC in its new DLNB, allowing European and Latin American satellite operators to migrate to digital channel stacking. Reference design from MaxLinear and STMicroelectronics to speed multi-channel Ultra HD HEVC satellite STB and gateway deployments. 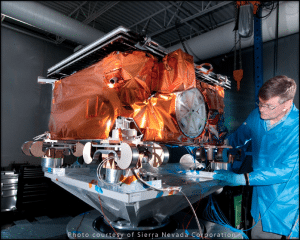 Tempus Global Data to use Utah State University-built STORM instrument to provide space-based weather data to commercial and government customers. Azerspace 1 satellite to broadcast Ukrainian TV channels. Skyline Communications announces new office for the Americas in Miami, Florida. Euroconsult report “Profiles of Government Space Programs” reveals decline in global budgets for space programs for first time in nearly 20 years. Ultra-secure communications payload on third AEHF satellite activated for first time, and user testing begins. The launch of Ukraine’s first-ever communications satellite has been delayed by the Russian annexation of Crimea. 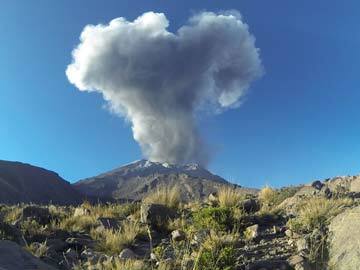 China delivers communications satellite project to Bolivia. As U.S. and coalition forces draw down in Afghanistan, a suitcase-sized satellite communications kit will help keep communications disruptions to a minimum. Goldin Associates acquires communications advisory firm Summit Ridge Group. The global M2M satellite communication market is expected to grow at a compound annual growth rate (CAGR) of 9.8% from 2014 to 2019 in new Research and Markets report. Recent talks between Charlie Ergen of Dish and Mike White of DirecTV reignite discussions on whether a merger is possible – familiar FCC and DOJ objections likely remain in place. Ball Aerospace and Aerojet Rocketdyne green propellant test results surpass expectations. Emerging Markets Communications establishes new location in Aberdeen, Scotland. RRsat is selected as key delivery partner of DFH Network for North American distribution in $6 million deal. NASA Data Systems partners with Avanti Communications to deploy satellite broadband in Middle East. EM Solutions gets grant from Australian government under the Defence Science and Technology Organisation’s Capability and Technology Demonstrator Program. NSR’s Energy Markets via Satellite, 4th Edition provides the industry-leading, dedicated analysis on the energy markets – from pipeline SCADA applications to semi-submersible drilling platforms. “NAB 2014 to Highlight the New Multiplatform Media Environment” by Virgil Labrador, “Trends in Broadcasting” by Elisabeth Tweedie, “Direct-to-Home Satellite Trends” by Dmitri Buchs, “Back and Forth with Jorge Villareal, Tomaz Lovsin and Eric Greenberg” by Lou Zacharilla, and “The Road to Sprint/T-Mobile Merger Goes through DISH” by Armand Musey. Sea Launch advises Eutelsat Communications to postpone the scheduled launch of its Eutelsat 3B satellite on April 15 due to installation discrepancy. 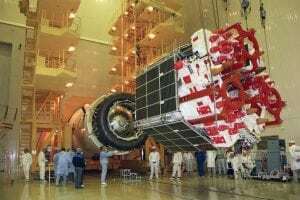 Indian Space Research Organisation (ISROI) scientists believe the failure of imported components for the satellite power supplies may be the cause of INSAT-4B glitches. Latest leak from Snowden – the NSA and GCHQ hacked into the systems of three German satellite communication providers. Capacity on nine Eutelsat satellites mobilised for worldwide high definition coverage of canonisation of John XXIII and John Paul II. Data on photosynthesis activity teased from current satellite data shows high productivity in U.S. corn belt. Battery technology company Saft looks to discoveries across multiple industries in order to improve pace of development for space-specific batteries. Mitsubishi Electric Corporation announces it has completed in-orbit delivery of TURKSAT-4A to Turksat. Inmarsat engineers worked out probable path of flight MH370 using Doppler effect of signals from the plane to their satellites. Advocates say robotically refueling and maintaining satellites in Earth orbit will allow government agencies and private companies to dramatically extend their lifetime. French and Chinese space agencies confirm joint venture to build ocean-surface radar satellite carrying instruments from both nations. Thousands of VSAT operators left in lurch by failure of India’s Insat 3 satellite. Research and Markets has added “Global Satellite Communication in the Oil and Gas Industry 2014-2018″ to their offering, discussing the expected growth of UDW rigs and role of satellite communication for UDW exploration. New Euroconsult research assesses distribution mechanisms within the Earth Observation value chain. 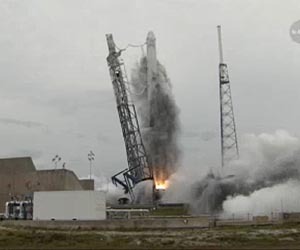 Third AEHF satellite begins transmitting using its protected communications payload, joining two other satellites undergoing system test in orbit with a suite of user terminals. Boeing Defense Space and Security, targeting 66% reduction in launch cost, wins three way competition for Pentagon contract to build and demonstrate low-cost airborne satellite launching system. New U.S. military weather satellites could launch on Minotaur rockets. Arianespace’s medium-lift Soyuz launch with the Sentinel-1A Earth observation satellite is moving into its final preparations for an April 3 liftoff from French Guiana. ESA orders nearly $200 million spectrometer from Airbus for polar-orbiting meteorological satellite to be launched in 2021. Commercial-off-the-shelf consumer components are now just as reliable as hardware specifically developed for satellites, driving the small satellite revolution, according to Surrey founder. 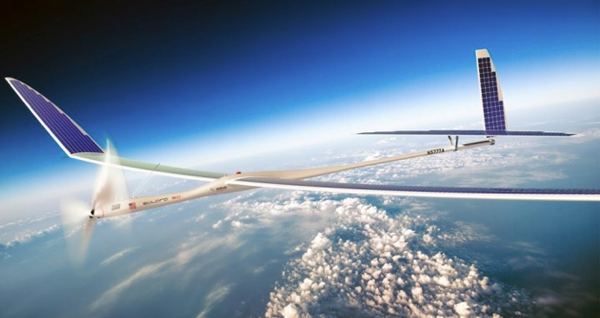 Inmarsat is supporting the Think Global Flight mission to highlight the importance of science, technology, engineering and mathematics (STEM) education. Thai satellite images of more than 300 objects in the south Indian Ocean produced another lead in the hunt for Malaysian Air Flight 370. Opening new assembly line, Orbital Sciences Technology announces it is manufacturing 81 new satellites for Iridium at its Gilbert Arizona factory. Asian satellite fleet operators and service providers are counting on the growth of high-definition (HD) television in the region to offset any drop in prices for C-band capacity due to oversupply. ISRO announces April 4 launch for new Indian Regional Navigation Satellite System 1B satellite. ETL Systems has been chosen by Boeing to support Inmarsat’s GX services for high speed maritime communications. 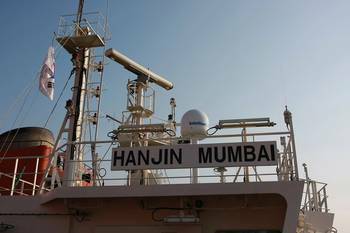 RHL Hamburger Lloyd Tanker selects KVH Mini-VSAT broadband to provide global broadband service for tankers. Novelsat claims that its newly introduced FreeBand solution gives broadcasters “free” bandwidth for video contribution. Gogo receives certification for in-flight connectivity in Europe. Japan Airline has selected Panasonic Avionics for an expansion of in-flight Wi-Fi for its international fleet, including 787′s, 777-200ER’s, and 767-300ER’s. 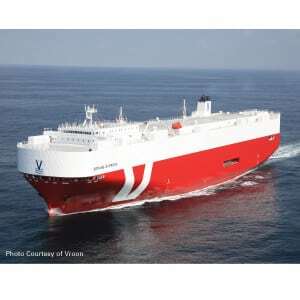 According to SVP of marketing and strategic planning at KVH, all the major sectors of the maritime industry are pushing for greater connectivity. Evolve Broadband deploys Globecomm Systems’ hybrid 4G LTE solutions. More than 1,000 satellites are in orbit. 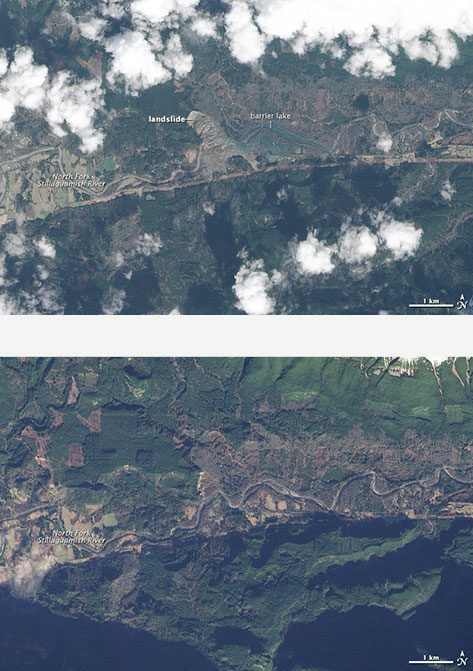 Landsat 8 uses Operational Land Imager (OLI) to observe fatal mudslide in Washington State. Recent deals may signal that civil government uptake could present tangible opportunities, thus softening the blow from milsatcom decline in most markets in the short/medium term. 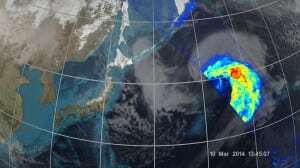 NASA and JAXA release first images from the Global Precipitation Measurement (GPM) Core Observatory. The National Broadband Network Company of Australia institutes a “fair use” policy and deploys additional capacity to allow its interim satellite service to function more effectively. 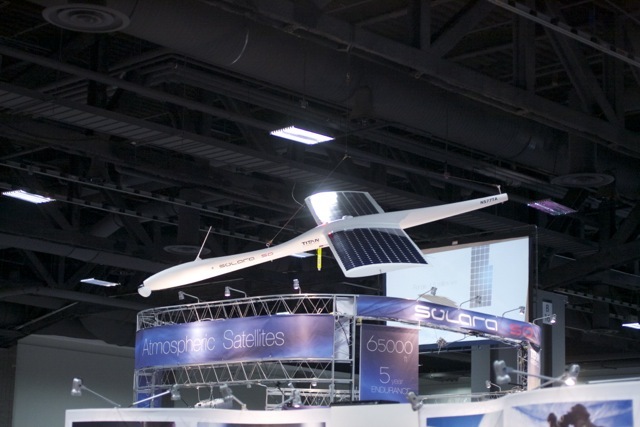 Yahsat and Thuraya co-host annual satellite industry reception in Washington D.C.
Delta Air Lines will be launching Gogo’s Wi-Fi service on international flights of Ku-band-enabled Boeing 747-400′s. New report by MarketsandMarkets puts value of M2M satellite communication market at $4,763.4 million by 2019. 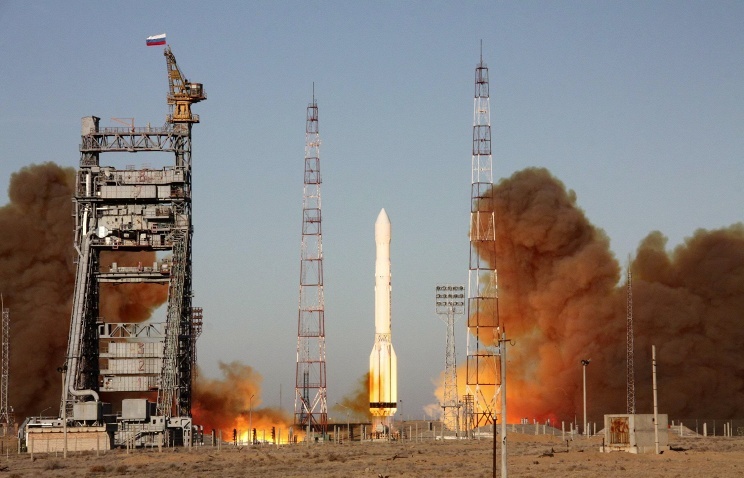 Russia’s Glonass M satellite successfully separates from “Fregat” stage and reaches orbit. JAXA chooses Mitsubishi Heavy Industries as prime contractor for development of new flagship launcher with greater commercial focus. Space history photo – Communication Technology Satellite launched in 1976, after five years of cooperation between Canada and the U.S.
Boeing meets key production milestones on initial 702 Small Platform (SP) all-electric propulsion satellites, with late 2014 or early 2015 delivery expected. C-COM increases its sales presence in the Middle East and Africa. Profen establishes Turkish Gateway Earth Station to manage internet traffic in Turkey provided on Avanti’s HYLAS 2 satellite. South Korea is likely securing an offset deal that will include a new military communications satellite along with its F-35A purchase. TV5MONDSEW HD chooses MEASAT for Asia-wide distribution. Federal agencies are learning that with recent developments, the tools of commercial satellite communications (COMSATCOM) are becoming increasingly efficient and effective. ViviSat, a satellite-servicing startup developing life-extension vehicles for end-of-life commercial communications satellites in geostationary orbit, has booked two customers for three missions, and expects to start building its specialized spacecraft by the end of 2014. Airbus Defence & Space launches new AuroraGlobal satellite communications package that collates Ka-band, Ku-band and L-band services, integrating offerings from Inmarsat, Iridium, Intelsat, Eutelsat, Telenor, Thuraya and SES. Inmarsat launches IsatPhone 2, with longest battery life in the industry, capable of receiving incoming call alerts with antenna stowed. Kratos has been selected by Turksat Satellite Communication to deliver a full-motion antenna system for installation at its Gölba ?, Turkey site. Satcom Direct earns initial STC from the FA for installation of its Satcom Direct Router (SDR) in Lear 60 aircraft. With the launch of the first six OG2 satellites coming up at the end of April, Orbcomm is planning to offer two new services that the company hopes will greatly expand its share of the M2M market. 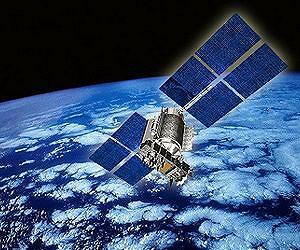 Lockheed Martin awards General Dynamics contract for U.S. Air Force GPS 3 satellite program. Arianespace successfully lofted Astra 5B and Amazonas 4A into orbit via their Ariane 5 ECA rocket on Saturday, March 22. At Mobile Deployable Communications Conference adaptability, agility, and scalability seen as key requirements, with a continued extant requirement for bandwidth and operability even as budgets tighten.